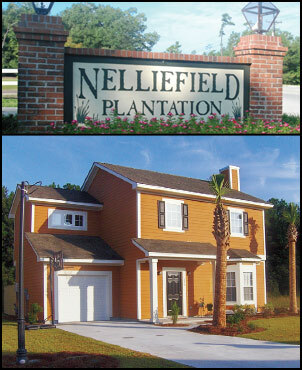 When you first drive into Nelliefield Plantation, you�ll be delighted by the look of this community. The houses are colorful, ranging from muted greens and blues to splashes of coral and rust. Built with HardiePlank siding, many of the homes are accented with brick, giving them a more high-end look. Architectural shingles add to the good looks and curb appeal. The homes are beautifully landscaped, and some residents even enjoy pond views. 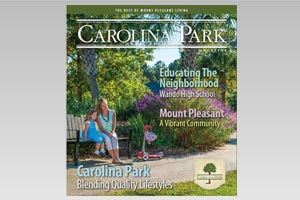 Nelliefield Plantation is located in the growing town of Wando, an easy drive from Highway 41 or the Clements Ferry Road exit of Interstate 526, more familiarly known as the Mark Clark Expressway. This charming neighborhood is just six miles from the exit, near the island community of Daniel Island and the bustling town of Mount Pleasant. And that is the beauty of Nelliefield Plantation. It is just far enough away from the bright lights and busy roads of Mount Pleasant yet near enough for easy access to shopping and the East Cooper beaches. The homes themselves are spacious, featuring three to four bedrooms in a variety of one- and two-story floor plans. Nine-foot ceilings are standard, as are spacious kitchens with maple cabinets in a variety of styles and glazes, and quality Whirlpool appliances. Extra touches are evident throughout and include ceiling fans with lights in all living areas and bedrooms and pre-wiring for phone, cable and fiber optics. Tankless water heaters mean no more running out of hot water mid-shower. John Dezinna of Coastal Cottages of South Carolina, among the contractors currently building in Nelliefield Plantation, believes the same quality that goes into million-dollar homes should also be foremost in more affordable housing. Dezinna is a licensed contractor with decades of experience in everything from foundations to those final finishing touches. Although he strives to include as many desirable features as possible, he is happy to provide buyers with additional upgrades such as hardwood floors and solid surface countertops. All this sounds like it could be expensive, but the homes in Nelliefield Plantation are surprisingly affordable. Compared to Mount Pleasant, where a typical starter home might be in the $300,000 range, Nelliefield offers pricing from the high-$100s to the mid-$200s. Better hurry if you are interested in one of these homes. At these prices, they�ll be snapped up quickly.